I’ve made a free mobile download to celebrate the upcoming release of my new book The Good Morning Book! We been making them like crazy over here and it’s been so fun. It’s a quick little project that takes about an hour to do together. I’ve added some instructions in the download, but it’s pretty straight forward. These little cuties pretty much figured it out on their own. “A book is just a book until a child picks it up and interprets it, that’s when the magic happens.” – Kari-Lynn Winters. Sonya White at the One Schoolhouse Foundation is doing such meaningful and beautiful work. She recently shared this video with me of her visit to St. Lucia and the Reading Rainforest event. It is an event celebrating books and reading. 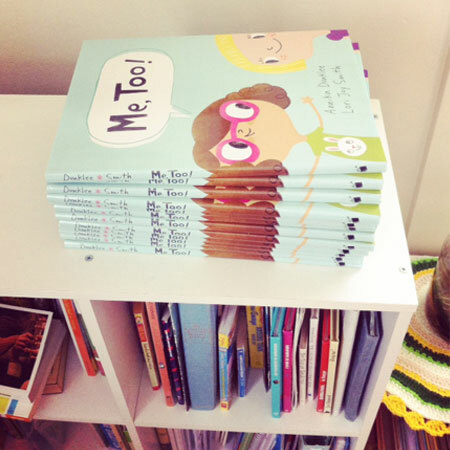 Me, Too was one of the books including in the celebrations. The video is beautiful. It is incredibly uplifting to see so many people doing such good things, and there is really so much magic in the world, mostly in the hearts of children. This video would have made me cry regardless, but the fact that I can see my book in the hands of children I never dreamed it would reach, was almost too much. Magical Animals and Good Mornings. My girls have been absolutely loving Kallie George‘s series called “Magical Animal Adoption Agency”. It has sparked all sorts of creativity over here. Magical animals are being crafted, rooms have been turned into adoption rooms, there are even unicorns in my bath tub! These books feel even more special because I have a small connection to Kallie. 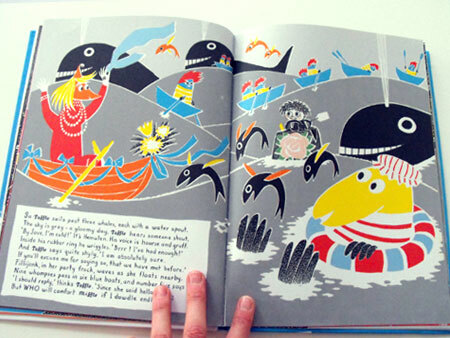 The first email I received offering me a children’s book illustration job was from her. 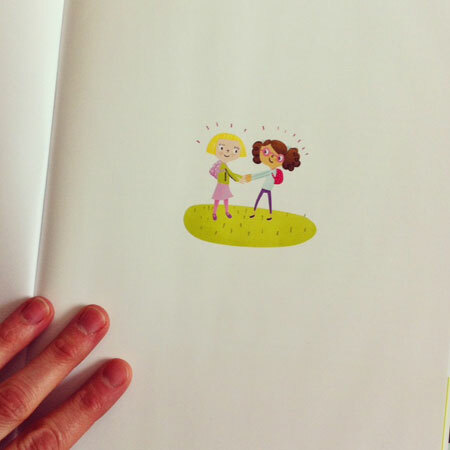 She and I worked on “The Goodnight Book” together. 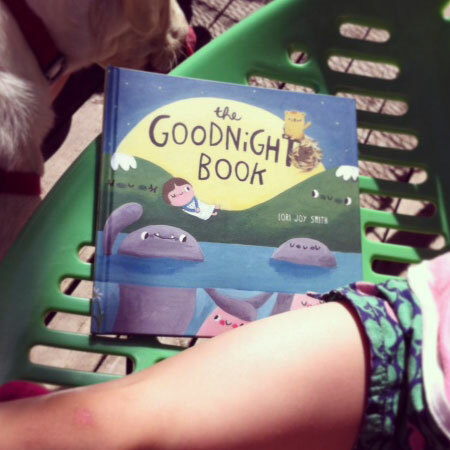 I’ve got the sequel to The Goodnight book ( The Good Morning Book) all ready to go. It should be coming out pretty soon. 2016 is a super busy year for me, I’m working on 4 books! A very different scenario from when I received that first email from Kallie… and I will always feel thankful to her for giving me my first book. Me, too! is out today! Me, too! is out today! 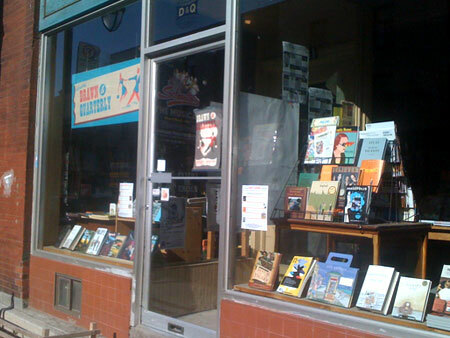 Here in Charlottetown you can find it at the Bookmark downtown. It is an exciting day indeed! I’m so excited to share my next book with you. It’s called Me, too and was written by the lovely and funny Annika Dunklee! It is about two best friends who face a challenge. I loved it the first time I read it and drew one of the characters just like my own best friend, Magda. 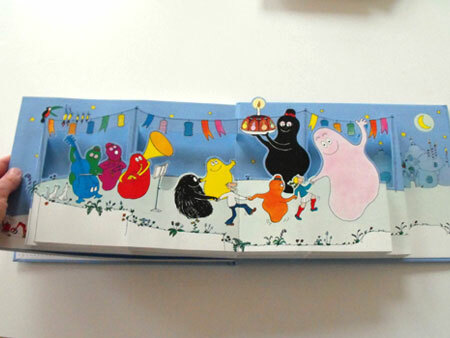 Madga is super cute and silly and always brings a big smile to my face… just like cute little Annie in the book. The book comes out in April. You can preorder it here on Amazon, or you can order a signed copy from me. I only have a few, so don’t wait too long. Just send me an email. I’m selling them for $15, plus $5 shipping for Canada, $10 shipping for the US. In my opinion this is the surest sign of success with a book, lots of giggles! I was interviewed by the PEIWBA in this month’s G! magazine. You can read it online here. The fruits of all of my labours are starting to show themselves, and this one is particularly sweet! Working with Bobs and Lolo was like some kind of amazing dream. 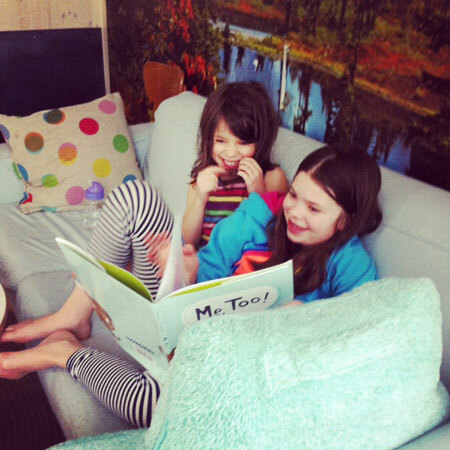 They are just like you would expect them to be… kind, sweet and very encouraging. This book is so beautifully written that illustrating it was almost effortless. You can order it from the store on their website. It’s available now! 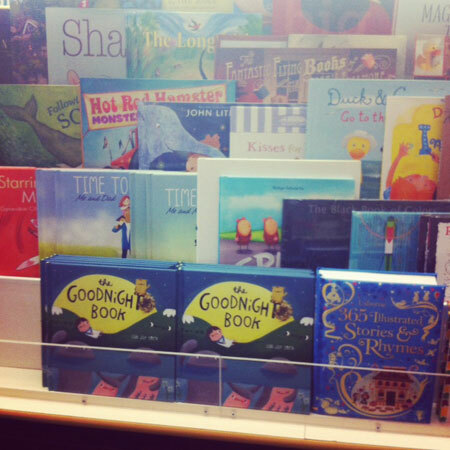 The Goodnight Book is out! Published by the fine Simply Read Books. I was so happy to see it in my favourite local bookstore last week. I’m planning a fun book launch at the Confederation Center Library… we are thinking a PJ party reading would be most suitable. I will post more here when I know more. 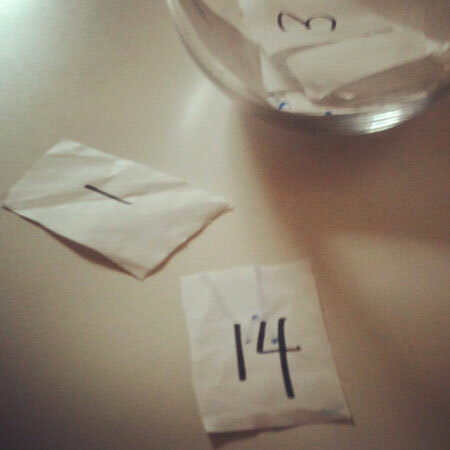 The randomly picked numbers picked by Sosi are 1 and 14, the first and last commenters! I will be sending Martina and Cathy an email to get your addresses soon. 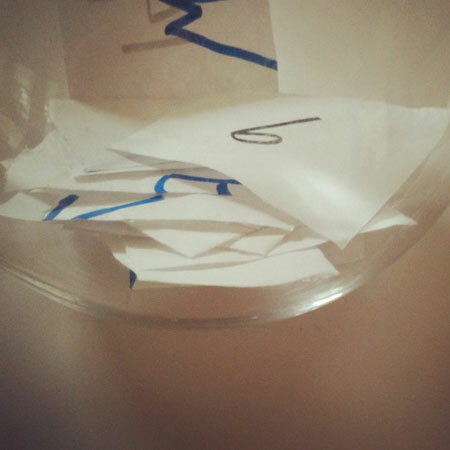 Thank you all for leaving comments, I loved reading about your happy summer memories. I think mine is riding bikes with Sosi one evening. It was golden hour and we rode along on the Confederation trail. We stopped and picked rose hips for jam, then kept riding after that. Some boys gave us some apples they had picked from a tree. Sosi wanted to keep riding and riding, not wanting to turn around to start the trip back home… it was one of those perfect moments you want to hold on to forever. 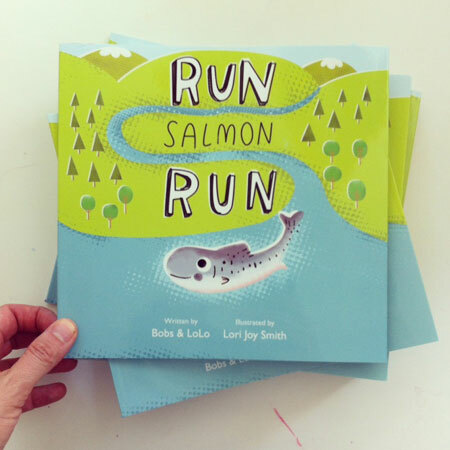 Robert Heidbreder’s book that I illustrated for Kids Can Press is available now! Here are a couple of spots you can order it. In Canada here and here. In the States here and here. Let me know if you start seeing it in the stores! 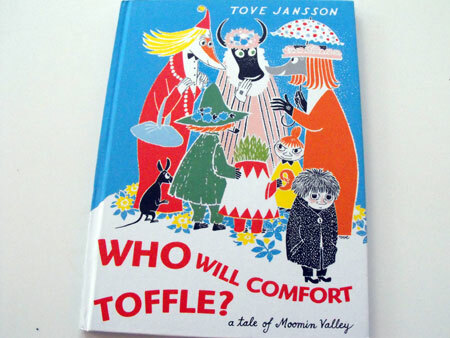 I bought Tove Jansson’s “Who will comfort Toffle?” mostly for myself, but Sosi also loves it. 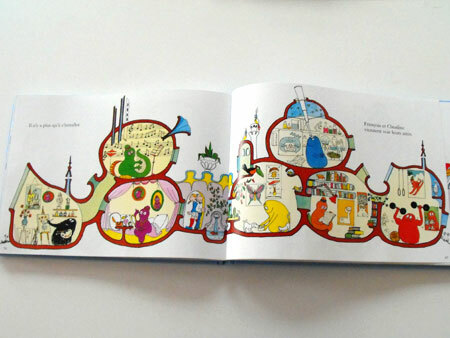 It is so gorgeously illustrated and made, I could go back to it over and over and always find something new. The story is so sweet and heartfelt. I want to frame each page and hang them on our walls. 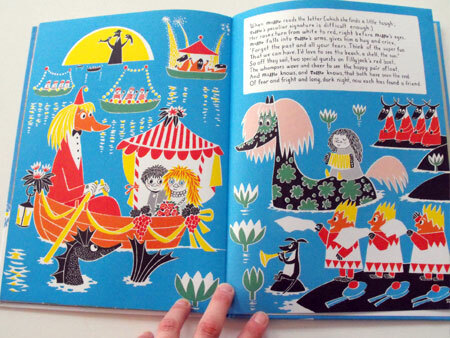 I’ve wanted to get Sosi into the Moomin comics and thought these colourful picturebooks would be a good start. I was right, she loves them. 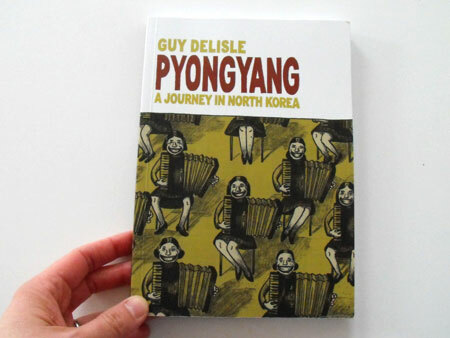 While there I also picked Guy Delisle’s “Pyongyang” for myself and devoured it. It was such an amazing look into the mundaneness of living in a part of the world which we know so little about. It was fascinating. I’d love to read more of Guy Delisle’s books. I also got to some lovely French bookstores to look for books to bring back for the girls. Ila loved this one I brought back for her. 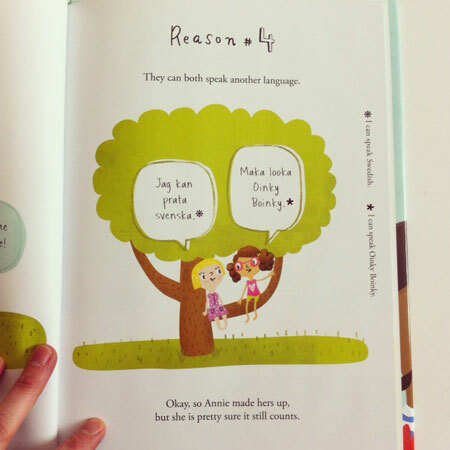 It has furry-bits and flaps and monkeys… all the makings of a perfect book in her opinion. 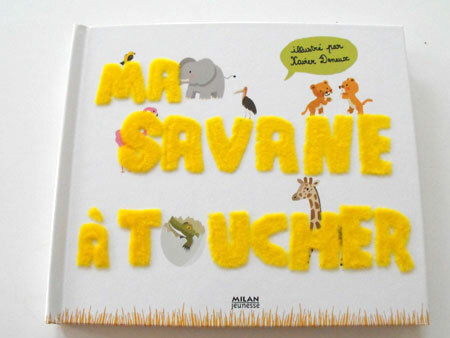 I wanted to find some really fun French books for Sosi, who is in French immersion. I saw this and once I started looking through it I couldn’t put it down. 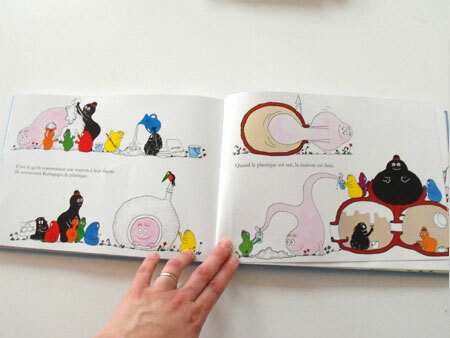 I grew up watching Barbapapa and all the happy memories flooded back looking at these pages. It even ends with a pop-up page, all books should end with a pop-up page! 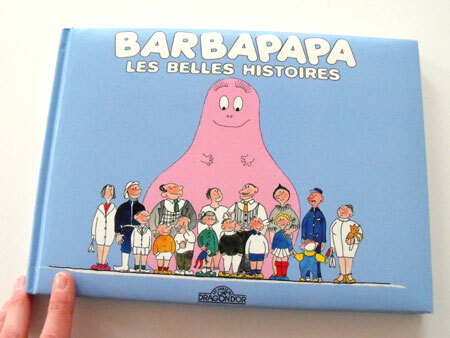 You can find all sorts of wonderful Barbapapa books at the Renault-Bray site. They even do free shipping on orders over 39$. I know I’ll be ordering more!